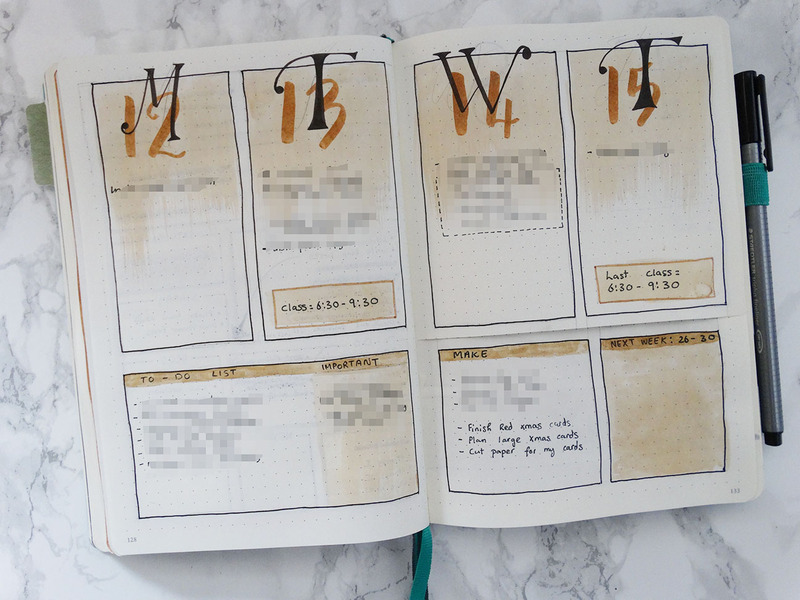 Okay, so my last few weekly spreads have been pretty basic spreads and it’s been hard to say much about them but things are changing for this weekly spread post because I tried something new with my bujo spreads and gave dutch doors a try (I think that’s what they’re referred to, when you cut a bit of the page away). I wanted to try make a spread that contained a to-do list I could carry over for two weeks seeing as a lot of the stuff on my to-do and make list are things that I can do whenever over the next few weeks and when I was looking on pinterest for ideas, I came across a dutch door spread and took some inspiration from that. I like to have my to-do list along the bottom of the page so I put it on the bottom third of the first left hand page with boxes for Monday an Tuesday above it and Wednesday and Thursday on the next page (yeah, this is also the first time I’ve done a week covering more than two pages I think). Then, I cut away the bottom third of the right hand page. On the other side of the cut page, I added the boxes for Friday and Saturday with similar sized boxes on the right to finished the week with Sunday and a spare box that I later turned into a blog post list. If I’d wanted to contain the spread and to-do list to the week I would have drawn the make box and next week box on the page with Sunday but instead I actually cut away the bottom of the page again. I did a similar vertical box spread for the week of the 19th-25th but instead of having two days per page I narrowed the boxes to fit a third in and decided not to have one for Sunday. Below the 19th-21st was cut away so I could still see the to-do list from the previous week and to finished off the spread, I added boxes underneath the 22nd-24th that would also cover both weeks. Oh yes, and for colouring I just added some light brown watercolour. 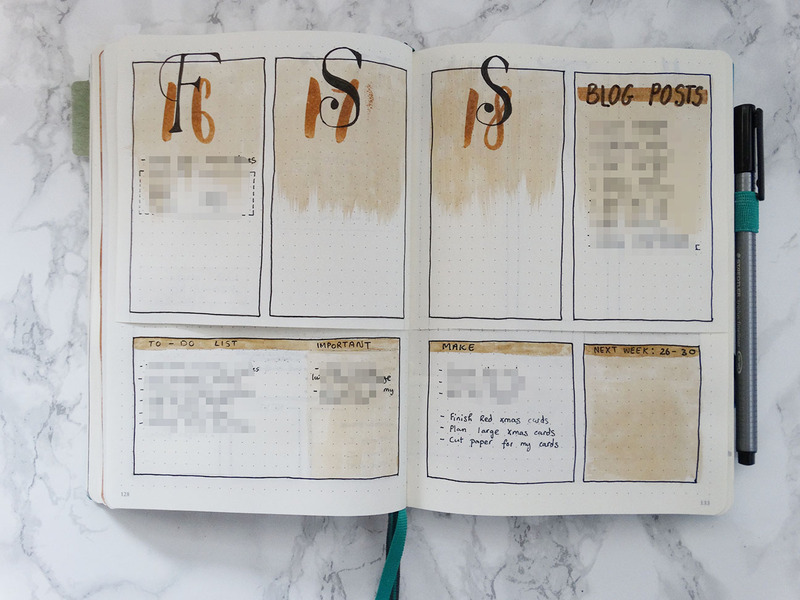 For the last week of November I just went for this very, very basic spread coloured with watercolours again – used up too much creativity on the dutch doors! But those were my last November spreads, let me know what you think of them. 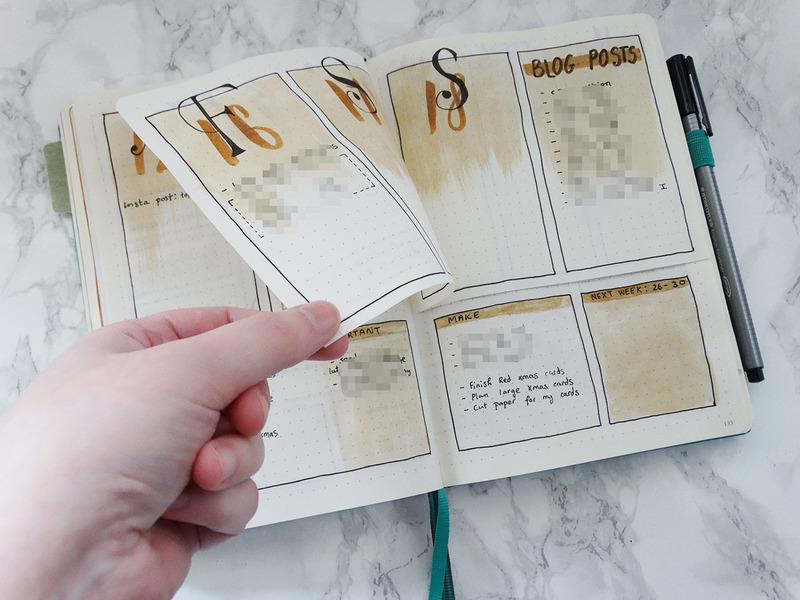 I don’t think cutting pages is something I’d do too often in my planner but it was fun to give it a go and it’s something I would do for the right week. I like the simple look of it! I think you did a good job! I love this! I really like the warm, end-of-autumn color scheme and that kind of fading look. I also love, love, love the way you did your to do list to cover multiple weeks! That’s fantastic! Thanks! 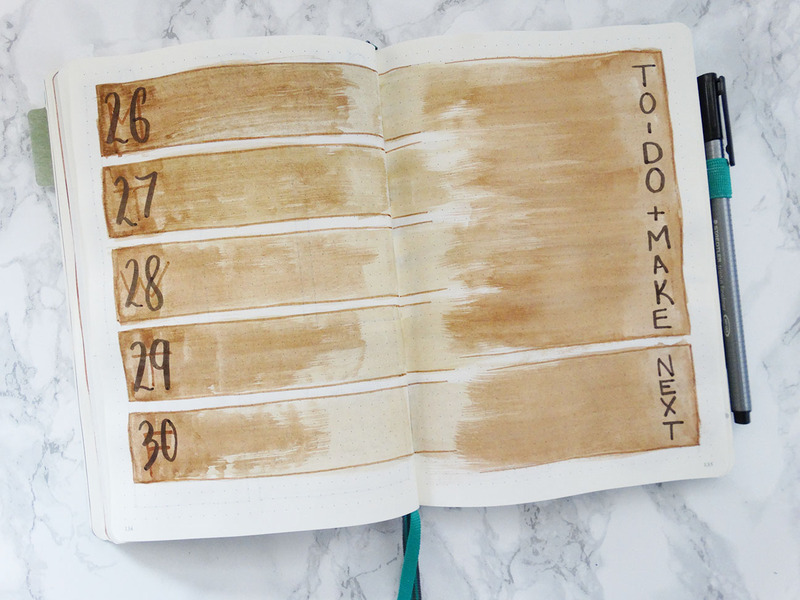 Yeah, it’s just getting to that time of year where I just have a number of things to do and it doesn’t matter when exactly, just as long as it’s done at some point before the end of the year so to-do lists that cover more than one week are quite useful!